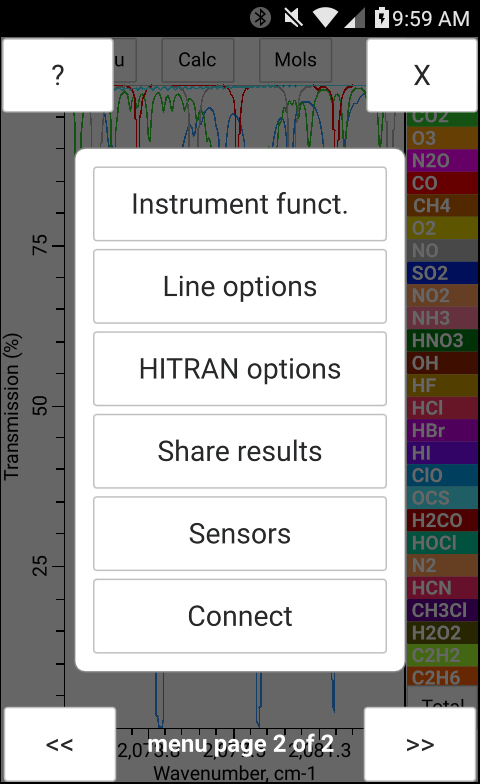 Stating with version 1.3 it is possible to remotely control and retrieve the results of bytran calculations over the Internet or local network (i.e. for devices connected to the same router). Such data exchange and control are carried out using the WebSockets protocol. 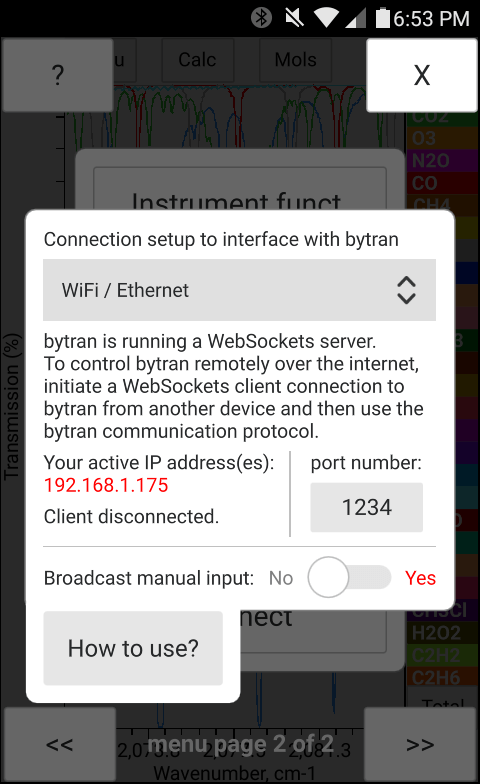 When the "WiFi / Ethernet" option is enabled under the "Connect" option of the main menu, bytran will start a WebSockets server. To initiate the communication it is necessary to open a client connection to the device running bytran with the "WiFi / Ethernet" option enabled. 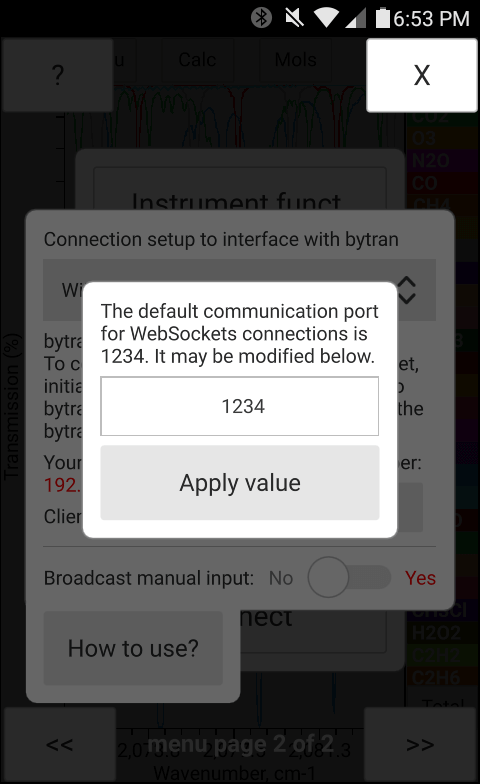 Bytran does not currently support client WebSockets connection (i.e. it can be connected to but cannot connect to a remote WebSockets server). 1) Start bytran on one device and open this webpage on a different device. Make sure both devices are connected to the Internet or a local area network (i.e. connected to the same WiFi router). 2) Within the bytran program go to "Menu" / "Connect" (see Figure 1 on this page) and select the "WiFi / Ethernet option"
3) Under "Menu" / "Connect" - "WiFi / Ethernet option" (see example in Figure 2 on this page) take a note of the device IP address under "Your active IP address(es)" to be used by the WebSocket client. 6) Click the "Connect" button on this page. If the connection is successfull you will receive a "CONNECTED" message in the "data exchange log"
7) Type in the desired bytran command and the paramter values into the "Text to send" field on this page according to the bytran communication protocol and press the "Send" button. For example, sending "#CALC" (the commands don't have to be capitalized) will start a calculation with the currently set parameters. Sending "#RESULT;SPEC;0" will return the high resolution total spectrum for the last calculation performed. If the "Broadcast manual input" option is enabled, the manual change of parameters in the bytran program will result in the corresponding commands being sent to the connected device (i.e. the web form below). This web-based WebSockets communication form was based on this example.